Life is super busy! Being organized will definitely help with the stress of everyday living. Sometimes though, just knowing how to get organized can be difficult. These Home Organizing Tips for a Daily System are sure to help! 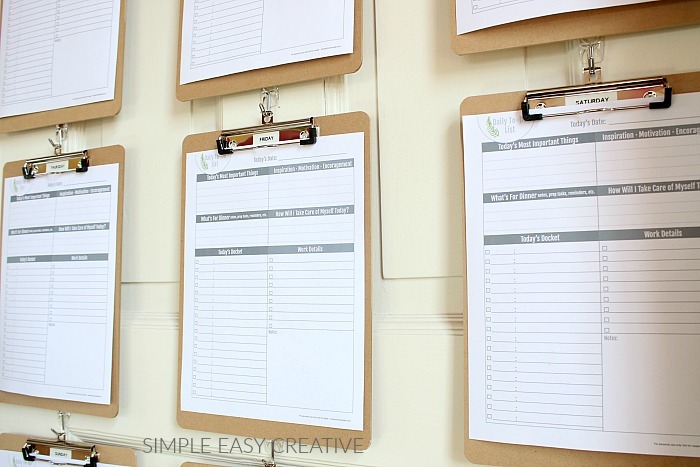 Each day of the week is separated onto individual clipboards and hung on the wall, along with a fun daily schedule printable to keep your life running smoothly! Over the years I have tried many, many systems to get and keep myself organized. And while I love my Household Binder to store menu plans, bills, monthly calendars and more, I found that I also needed a Daily System. I wanted a place in my office that I could see each day of the week, and be able to write down what I needed to do for the business, blog, home, and life. So I came up with the clipboard system. On each of the FREE Printable sheets there are places to add the most important things for the day, inspiration and encouragement, what’s for dinner, self-care, and a list for to-do list with boxes to check off. We intentionally kept this printable with a very small amount of color because we know how expensive it can be to print at the store or buy ink for your home printer. 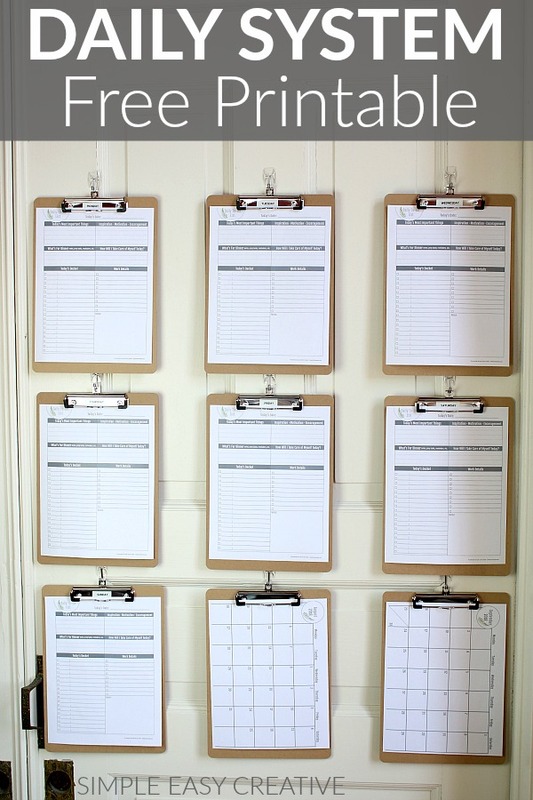 You can find clipboards at just about any office supply store, Target or Walmart, or you can purchase them online. Make sure they have a hole on the back to easily hang them. I used the label maker to add the days of the week. We hung them on the wall with Command Hooks. After the Daily System was hung, we added the other items to create a Command Center. The Household Binder stays on the desk for quick access for menu plans, cleaning schedule and more. 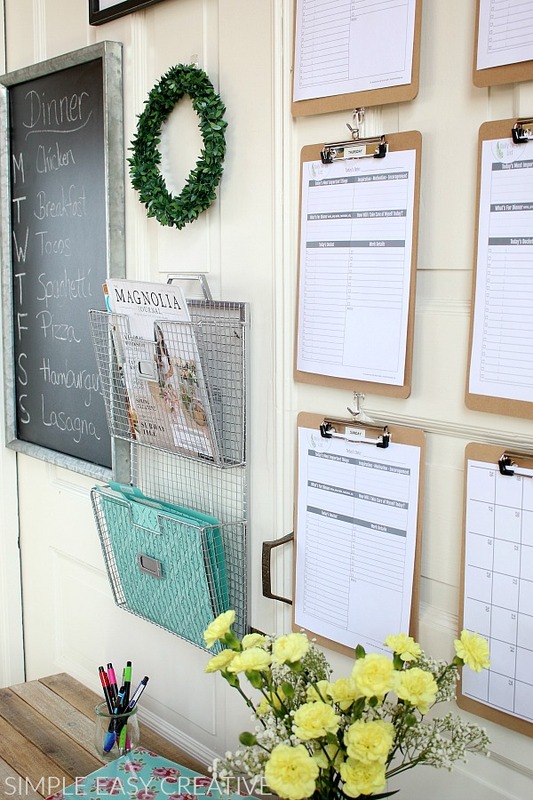 The Chalkboard holds the weekly menu, and the Wire File Holder holds important files and magazines for inspiration. I found the file holder, chalkboard and sign at Michaels. The wreath I had from another project. Are you ready to get organized? 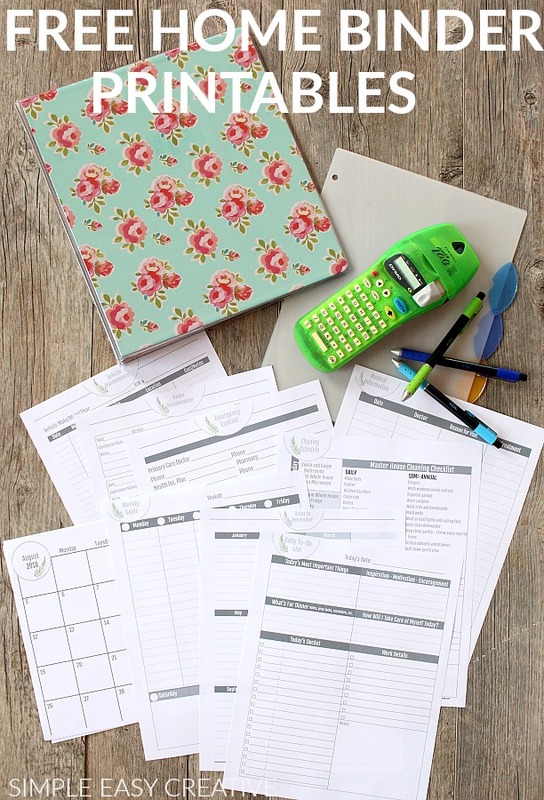 These FREE Household Binder Printables are sure to help! Sign up below and we will send them right over! And be sure to check out the Household Binder for more inspiration! Great system! Thanks for sharing it at the Craft Frenzy Friday party on Mom Home Guide! A system like this might work for me, as I can remember things better if its right in front of me! Wow!! This was exactly the inspiration I needed. Well done and BRILLIANT. Thank you so much for sharing! Ok, color coding the family calendar is brilliant, and I looove your clipboard system! Thanks for sharing with us at The DIY Collective Link Party, hope you come back again next week! xo! I so needed this in my life right now. Fabulous job! I would love for you to share this at our What’s it Wednesday Linky Party! Fantastic way to start the year with inspiration. I like these ideas! Thanks! This is the epitome of organization! Thank you for the inspiration! The colored pens you use can also be used on fabric and the ink can be “erased” with a hot iron. Can be ironed off of paper too. Very cool system. I love how colorful it is too! I like this idea because I’m an out-of-sight-out-of-mind type of girl. I need to be able to see everything or I’ll forget about it. Oh yes, I totally agree Bonita. Thanks for stopping by! Great ideas. 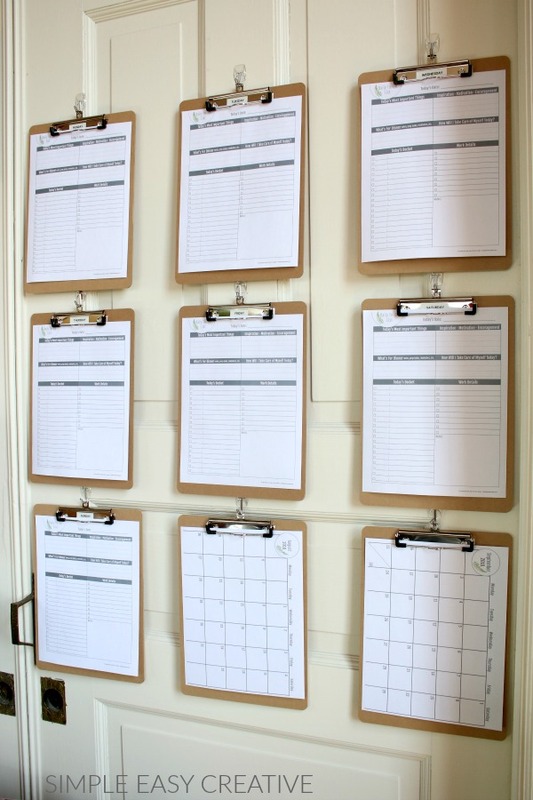 I love creative ways to be more organized and help the family to do so as well. That’s an awesome idea Jessica! So excited you are enjoying it! Great idea! 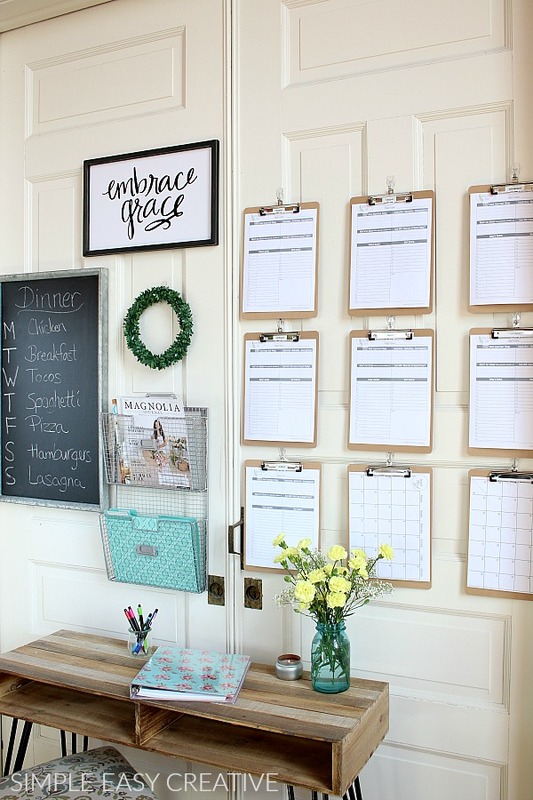 Love how you can see each day of the week at one time, but that you can still easily take the clipboard down to write on it or have just the specific day in front of you. Thanks Laura! This system is definitely keeping me more organized.